A close friend once told me that her vocation to vowed religious life was like an itch that wouldn’t go away until she scratched it. Interestingly, I would never describe my call in that way. And I believe it’s important for us to appreciate that each experience of being called by God is unique, particular and different one person to another. As my twin brother came to the point of proposing marriage to his wife, I realized that he and his wife were drawn to each other – attraction – they spent time with each other – getting to know you – the more time they spent with each other the more time they wanted to have with each other – a deepening – and they came to believe they should be with each through life – commitment. The steps and pieces may unfold differently in a call to religious life, however, attraction gives way to wanting more time with and gives way to believing (faith) this is right which gives way to wanting to commit for the long road. Discovering we may not be doing what the mainstream is doing can be disquieting, but reflecting on what’s going on in the broader society brings us to see not everyone is a lawyer or teacher or bricklayer or nurse or pilot or whatever. 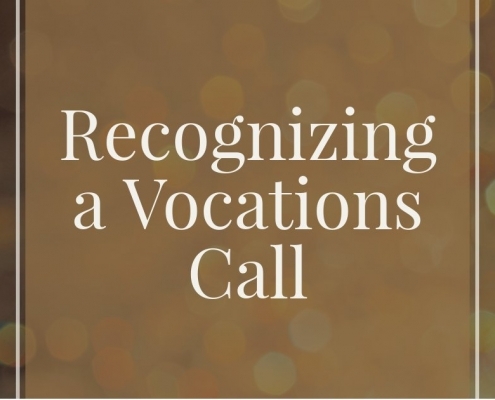 Hopefully, what we do see is people recognizing their attraction and bothering to give time to get to know and experience a growing conviction and taking the step to invest one’s energy in the way that is their vocation. And I pray this may be unfolding for you in your life.